"A Look of the Past with an Eye to the Future"
Welcome to Bondir English Springer Spaniels web site. If you have questions about our dogs, breeding program or the breed in general, please feel free to contact us by e-mail. Please use the buttons below to navigate the site and visit with our dogs. We hope that you enjoy your visit. Please note that we are in the process of re-doing our web site. There may be some links that do not work. Please bear with us as we make changes. Thanks! "Gigi", Ch Bondir's Gamine Georgine A/C RN, AGN, AGNJ, NAP, NJP"
We have owned English Springer Spaniels since 1979 & have been hooked on the breed since that time. Bondir (French for "to spring" or "to leap"; and pronounced "bohn-DEER") consists of three sisters Lynn, Anne & Barb Dorsay. Originally from Ontario, we have lived in Alberta Canada since 1978. 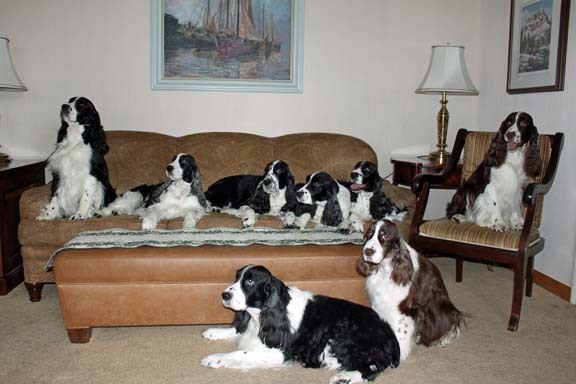 In 1989 we became founding members of the Wild Rose English Springer Spaniel Association of Alberta (WRESSAA). If you are looking for an English Springer Spaniel or information on the breed, please check out on our site the English Springer Spaniel Breed Information section. It includes links to The English Springer Spaniel "Is it the Dog for You? ; the Canadian Kennel Club (CKC) breed standard; Recommended Readings (including breed and training books); and the "Responsible Puppy (Springer) Buying" - a guide to purchasing an English Springer Spaniel. You can also find links to Rescue sites in Canada, the United States and Great Britain on the English Springer Spaniel Rescue information page and don't miss checking out the English Springer Spaniel Links. Are you interested in obtaining an English Springer Spaniel Puppy? If so, The Springer Puppy Internet Search Site is a great place to check out. This site will help you find the quality pet that you deserve. Please follow the above link or click on the banner below. Copyright © 1997-2013 Lynn, Anne & Barb Dorsay, Bondir English Springer Spaniels. Last revised: February 05, 2013.